As much as important players being retained by their Aviva Premiership sides for senior club duty and injuries wracking key areas of the squad all played into it, it was still a disastrous campaign by any team’s standards, let alone two-time Junior World Championship winners England. 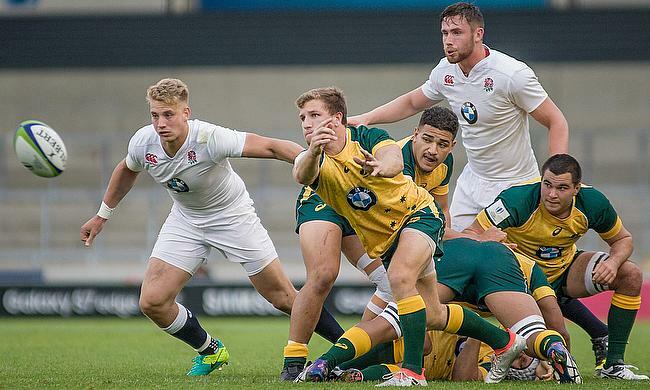 This U20 side were written off by many heading into the World Rugby U20 Championship but now, after three rounds of fixtures, England sit atop Pool B with 14 points to their name, giving them the number one overall seed and a place in the semi-finals against South Africa. Under the leadership of new head coach Martin Haag, England have run in 12 tries, conceded just two and have comfortably the best points differential in the competition at +86. Players were rested in their opener against Italy (48-10), they were recalled and found form ahead of their match with Scotland (44-0) and though tight, they were also able to see off Australia (17-13) are swept of Pool B. As gloomy as things looked during the Six Nations, which included home losses to Ireland and Wales, this was never a bad crop of U20 players. In fact, it may be one of the most talented U20 crops since the age-grade was created eight years ago. In terms of potential ability, it certainly deserves consideration among the victorious classes of 2013 and 2014, many of whom are now representing England’s senior team in Australia. This class was a victim of its own ability in the Six Nations. Harry Mallinder (Northampton Saints), Theo Brophy Clews and Johnny Williams (both London Irish) were all unavailable due to being required by their Premiership clubs. Those three were regulars in their sides in both domestic and European competition and all three took to senior rugby in surprisingly quick fashion. Ollie Thorley (Gloucester) and Joe Marchant (Harlequins) were available but were also being utilised by their Premiership clubs and Will Evans (Leicester Tigers) also got his first tastes of Premiership rugby but had not been included in the original U20 squad. There has been no point since the U20 category was created that England have been able to field as many as six players in their U20 side who have experience of Premiership rugby. After the dark days of the Six Nations, it’s only now becoming apparent just how good this class can be. Mallinder has taken pole position in the race for World Rugby Junior Player of the Year, although he will face competition from Marchant and Evans, not to mention a number of Irish and Argentinean players. With depth at inside centre and openside flanker still some of the bigger question marks about Eddie Jones’ England, the rises of Mallinder and Evans should be noted in particular. The loss of Brophy Clews to injury is a blow to Haag and the U20s but the London Irish man has shown enough to be considered a very special talent for the Reading-based side moving forward. A year of exposure to further first team rugby in the Greene King IPA Championship will not harm the development of the 19-year-old at all. On the back of a dominant set-piece and probably the best control of the breakdown England has had at U20 level for years, the English back line is beginning to move through the gears. Darren Atkins (Bath) and Sam Aspland-Robinson (Harlequins) have both profited from this and have been able to showcase their dangerous ability with ball in hand. They are amongst a solid group of first year players who will all be eligible for a second year of service in 2017. Of England’s 26-man squad, seven will be eligible for next year’s event in Georgia. Atkins, Aspland-Robinson, Brophy Clews, Max Malins (Saracens) and Harry Randall (Gloucester) should all return among the backs, whilst Evans and Zach Mercer (Bath) will still be available amongst the forwards. With Mallinder looking like this year’s answer to Maro Itoje or Anthony Watson, and a number of others ready for even more Premiership rugby next season, England’s age-grade pathways continue to churn out talent at unprecedented levels. Coupled with the successes of the senior England team and Premiership sides recently, this class of U20s speaks of a very bright future for English rugby.